Mackay’s Town Hall, located in Sydney Street is an integral part of the City’s history. 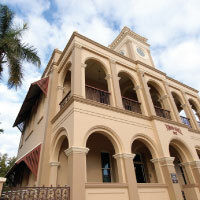 Originally constructed in 1912 the Town Hall is culturally significant as it provides a history of Mackay in the early 20th Century. The hall was initially built as the centre of administration for the Mackay Town Council and the building served this role until the construction of the Mackay Civic Centre in Gordon Street in 1975. It was refurbished in 2001 with support from the Queensland Heritage Trails Network.